First the secret: Latinos are just as likely as Whites and Asians to be "green" consumers! According to the Natural Marketing Institute, a respected marketing research firm, in 2009, Latinos represented 4% of U.S. population-and 4% of U.S. green consumers, too. What's more, green Latinos tended to be equally distributed among the same types of green segments as Whites and Asians: LOHAS (Lifestyles of Health and Sustainability) - 4%, Naturalites 1%, Drifters (status-conscious) - 4%, Conventionals (resource conservers) 4%, and Unconcerned 3%. Myth #1 Green products don't work as well. Fact: Method, Tide Coldwater, and Clorox Greenworks brands have been developed specifically to work as well or better than regular products-and command a slight premium price to boot! Myth #2 Consumers don't want to buy green products. Fact: Green purchases represented $290 billion in sales in 2008, up from $219 billion in 2005 (Source: NMI, 2009). Myth #3 Green products are more expensive. Fact: Thanks to economies of scale due to high volumes, many green products today are competitively priced versus "brown" counterparts; and often can make up for premium pricing many times over during their lifetimes due to savings on energy and water, or simply better performance and value. 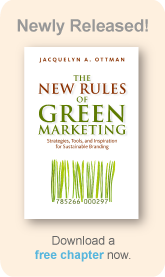 Myth #4 Only specialty stores sell green products. Fact: Major supermarkets now carry their own brand of organic products (e.g., Safeway's 300- item USDA certified "O Organics" line), and Wal-Mart is quickly making "green" a priority for vendor selection. Myth #5 Green products aren't really "green". Fact: No product can be truly "green" since all products use resources and create waste, but products can be "greener," denoting a continuum toward sustainability. Myth #6 Natural products are more healthful. Fact: Arsenic is a natural substance, yet deadly. Myth #7 Plant based products will degrade in landfills. Fact: No product, even those labeled "compostable," will degrade in a landfill. Compostables will only degrade in industrial composting facilities or in backyard composters at high temperatures. Myth #8 100% recycled products are better for the environment than 10% recycled products. Fact: Depending upon how far most recyclables must travel to recycling centers for processing (creating greenhouse gases in the process), products with 10% recycled content could actually be environmentally preferable to more recycled counterparts.